In search of Robin Hood? 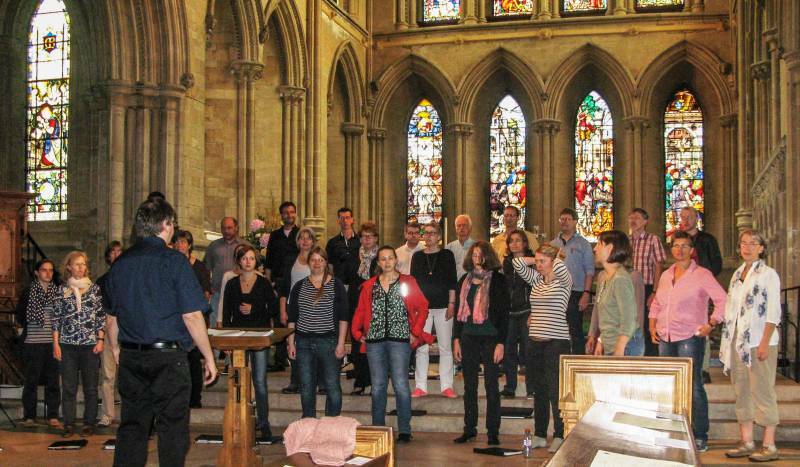 In August 2015, Sinfonia Chorale welcomed the Bergedorfer Kammerchor and their conductor, Frank Löhr, to Nottingham. Some members of Sinfonia visited Bergedorf in May 2014 and had a most enjoyable trip, making music together and singing in some magnificent venues. Since it was founded in 1946 by Helmut Wormbächer, the Bergedorfer Kammerchor has had an important part to play in the cultural life of Hamburg and North Germany and since 2003, the artistic development of the Choir has been in the hands of Frank Löhr, Professor of Choral and Orchestral Conducting at Hannover College of Music and Theatre. The Choir has approximately fifty singers and performs sacred and secular choral works from all ages. Each concert has a carefully structured programme which over the series, spans all styles of music. 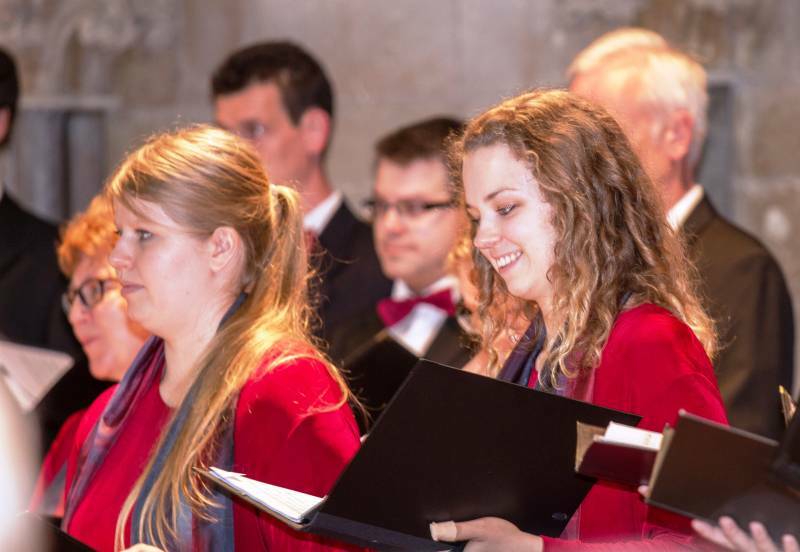 Alongside performances in North Germany, the Choir regularly gives guest performances in the Abbey at Marienmunster and has in recent years been on concert tours of Saxony and Italy. 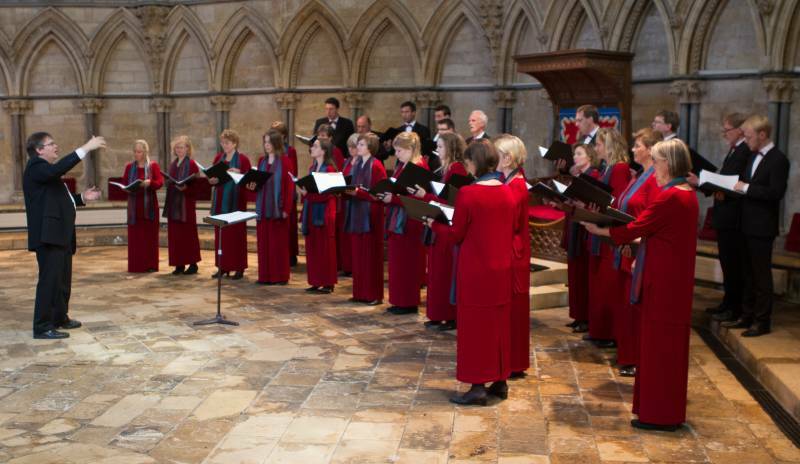 On Thursday August 20th, they gave a lunch time concert in the Chapter House at Lincoln Cathedral and on Friday August 21st, they performed in Southwell Minster as part of the Minster’s regular Lunch time series. Both concerts were extremely well attended, especially at Southwell where the audience exceeded 200. The visit wasn't all hard work and no play as many of the German Choir joined up with Sinfonia Members for a bowling match on Thursday night, which preceded a valiant effort to drink the Trip to Jerusalem dry! High on the Bergedorfer Choir's wish-list was a visit to Sherwood Forest to explore the hunting ground of Robin Hood and his Merry Men, so after a sociable buffet lunch at the Saracen's in Southwell our friendly coach driver duly obliged. On the final day of their visit, Saturday August 22nd the Sinfonia Chorale and the Bergedorfer Kammerchor gave a joint concert at St. Barnabas Cathedral, Nottingham. The exciting programme included works by Schutz, Mendelssohn, Distler and arrangements of some Northern German Folk Songs by Hellmut Wormbächer from the German Choir, and works by Weelkes, Holst, Larley and Whitacre from the Sinfonia Chorale. The combined choirs were joined on stage by a founder member of the Bergedorfer Kammerchor (who now lives near Nottingham) to sing Bruckner's Locus Iste at the end of the first half. The concert ended with Cecilia McDowell's Ave Regina, one of 44 anthems included in the Choirbook for the Queen, commissioned by Prince Charles for the Queen's Diamond Jubilee. 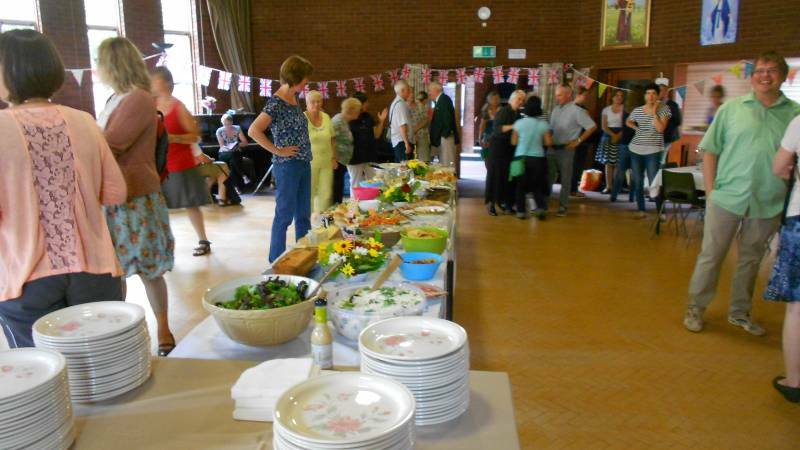 Between the rehearsal and the concert, the Choirs and their families relaxed with a magnificent British themed buffet supper in the Cathedral hall and the celebrations continued well into the night after the concert had ended.
" I just thought I'd let you know how much I enjoyed last night's concert with the Bergedorfer Kammerchor and how marvellous to have a full house with an audience who appreciated what they had heard. The music chosen by each Choir was complementary, with the BKC singing German music deeply rooted in the past and the Sinfonia Chorale, after the Weelkes and Byrd, waving the flag for music written more recently. I'm wondering how many of the BKC will be asking for the music of Whitacre to be included in future concerts. I was delighted to see the Sinfonia Chorale arrive at the platform with Ladies from the left and Men from the right (no Fidelio prisoners to be seen!) and smartly take their places with big smiles. The whole platform was beautifully lit from Jon's warm lamps making everyone look happy and healthy. A really encouraging start to a concert! The diction in When David heard by Weelkes was good and at the words 'Oh Absalom, Absalom, my son', the deep emotional content of the singing made the hairs on my arms stand on end. There was quite a long silence at the end of the piece while the audience came back to earth and started applauding. Sometimes you just don't want to break the spell. The beautiful opening chords of Holst's Nunc Dimitis were glorious. I heard Water Night, by Eric Whitacre years ago on Radio 3 before he became popular and remember talking to Tom and Megan Zadik about it. We had been very impressed then and last night's performance was equally impressive. I think you need to be in the audience to take in just what is happening and to appreciate the harmonies which are particularly poignant in the quiet passages when all voices merge creating a wonderful unearthly sound. In my programme I wrote 'magical'. Clare Devine's solo in Patrick Larley's A Girl for the Blue was stunningly beautiful. I couldn't make out the choral words but the harmonies and intensity of the music were compelling. I need to know the piece better. Everyone loves the beautiful melody of Deep River and Richard's arrangement included many quiet passages which were quite exquisite. "